Cedar shoe trees will greatly extend the life of your footwear. They help with maintaining the shape of your shoes, prevent creasing and cracking. They also draw moisture which causes deterioration of leather. Plastic trees help with creasing but does not absorb moisture. We carry a full line of Rochester Shoe Trees. Shoes need a day off. If you want your shoes to last longer, never wear them for two consecutive days. Rotate your shoes with another pair of shoes and let them rest with cedar shoe trees. The more shoes you have the better. Clean your shoes periodically with leather cleaner. At minimum wipe them off with a damp cloth. Put in your cedar shoe trees and let them air dry. Shoes should never be put close to heat sources which can dry out the leather. Set them out in the sunshine at most. When shoes are dry, polish them with a quality wax polish. Rub the polish well into the leather with a soft cloth, use a small brush to get into creases and welt, then buff with a horse hair brush and or cloth. Repeat process for a better shine. If you want them to look even better repeat the process again and again. About three to five coats of polish is when they really start looking good. After several coats of polish, the shine will become deeper and more brilliant. Cream polish is good for softer leathers and helps with conditioning. Paste polish will create a higher shine. Both will work fine. Most of the time we use cream polish first and then paste polish. If footwear has been exposed to dirt or contaminants, clean immediately with a soft brush, then a damp cloth with mild soap or saddle soap. Always clean before treating. Let dry. Treat the leather with a quality footwear oil or wax product on a regular schedule. This will help preserve the leather. The key to keeping suede and nubuck in top shape is preventative maintenance. Before you wear the shoes, protect them with a water and stain repellent designed specifically for suede and nubuck. As soon as you notice water isn't beading up, spray them again. Use a suede cleaner and suede brush to keep your shoes looking good. For light color delicate uppers use nylon brush, for durable outdoor shoes you can use a brass brush. 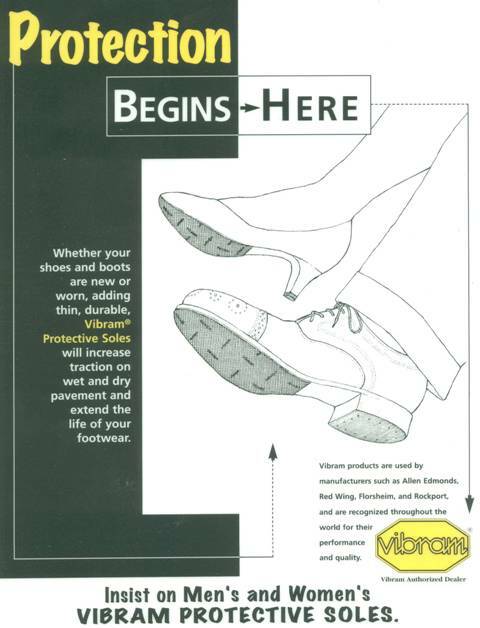 Adding a sole protector prolongs the life of your shoes tremendously. Stylishly thin, long wearing rubber top sole protects the outer sole from wear and tear. Water resistant and skid proof, protective soles will make any pair of leather soled shoes last a lifetime.